I created this smilies for a forum of mine, and thought it would be usable for other people, too. All png-format and almost all 15x15px. Screenshots to small...can't see anything! What do you mean? 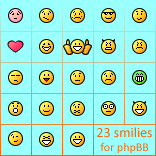 The screenshot is 156x156px and shows all smileys at true size..